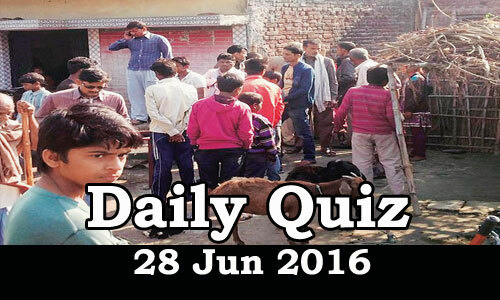 Daily Current Affairs Quiz 28th Jun 2016, Current affairs and GK questions on National and International are listed in the Quiz. Candidates those who are preparing for Government Jobs and IBPS/SBI/RRB exams and all other exams can use these questions. 1. Moving towards modernisation of sea ports, Modi government has inaugurated an RFID-based access control system at which port? 2. Majuli, a 400-square-kilometre island in the Brahmaputra river, became India’s first island district. The Island belongs to which state? 3. Which state government signed a memorandum of understanding (MoU) with a three-nation consortium for the construction of a Rs.10,183 crore gas-based fertiliser plant? 5. Odisha government launched a scheme to provide education loan at 1% interest to students pursuing higher studies. Name the scheme. 7. India ranked low at 105th position globally on a worldwide Human Capital Index. Which country topped the list? 8. IFC, Wadhawan Global Capital to invest _______ crore rupees in Aadhar Housing Finance to help the housing loan provider to lower income families double its business. 9. State-run telecom operator BSNL will expand its network in which state by installing 2,000 new mobile towers in the next two years? 10. FMCG major ITC will invest _____ crore over the next 2-3 years to set up 8-9 factories across the country for manufacturing of food products. 11. Ulf Mark Schneider is named as the new CEO of which company? 12. Who has appointed as the new chief executive officer (CEO) of the National Investment and Infrastructure Fund (NIIF)? 13. “Long March-7” a next-gen rocket; on track for ambitious space program was successfully launched by which country? 14. Sanjeev Rajput is related to which sport? 15. Name the founder of Titan Co. Ltd and made it an internationally renowned Indian watch brand passed away recently?